While dogs run on trails, enjoying the wilderness and smells just like humans do, it is important to have your dog by your side when you encounter other people. 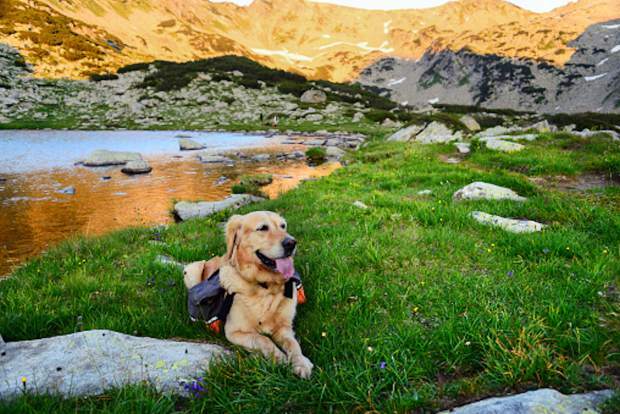 Dogs are a part of life in Summit County, and that means they like to do anything and everything their humans love about the outdoors. Earlier this summer, a pit bull was rescued near Quandary Peak when it stopped walking after its paws had been beat to a pulp. The dog was just fine, but at 65 pounds he required a helping hand from the Summit County Rescue Group. How can you protect your hiking partner from the same fate? It starts with packing the essentials like water, treats and a leash, but it goes deeper than that, especially for dogs from out of town. Along with the basics, Delaney also suggests packing a pair of dog booties or vet tape, just in case your dog cuts its paw or starts favoring one leg over the other. Again, just like humans, dogs need to take a break on occasion, so when you stop for a drink and snack keep the animal close and check its paws. Another good addition is a hiking bell for dogs that go off leash. This helps wildlife steer clear — and also helps you keep tabs on Fido, even in the thickest woods. it was one of those encounters when I wanted to defend my dog, even though I knew she and I were honestly in the wrong. On a sublime Sunday in late July, I met up with a few friends to hike the Ptarmigan Peak Trail outside of Silverthorne. My 8-year-old mutt was the only dog in the group, so as usual I let her hike the first section without a leash, and as usual she took a shoulder dive into the first fresh, plump pile of horse poop she came across. That’s what I get for letting her roam free sometimes — the dog just wants to be a dog. After cursing and mumbling and washing her clean with the extra water bottle I brought (if only to get rid of the stench until we got home and could shampoo,) the rest of the hike was unexpectedly serene. Ptarmigan might be within spitting distance of Interstate 70, but even on bustling summer mornings it tends to be less crowded than Quandary Peak, the Rainbow Lake area, nearby Tenderfoot Trail and other hot spots for dog walkers. We didn’t encounter another dog the entire day, but I knew the trail is popular with horses, and if two trail-user groups get into more verbal tussles than dog walkers and horse riders, it’s mountain bikers and everyone else. But that’s neither here nor there. Around the bend, still hidden behind thick stands of pines and occasional aspens, was an older woman and her horse. She was in front and on foot, leading the horse carefully down a brief, steep section of trail. My dog didn’t bark, didn’t lunge, didn’t even seem too curious, but the minute I heard the tone of her voice I knew she and her horse had encountered bad dogs in the past. For a split second I felt offended — “Why is she already lumping my dog into the ‘bad dog’ category?” — and then put on my responsible dog-owner face. I whistled, my dog came to my side, and then our entire group stepped off the trail to let the woman and her horse pass by. My animal obediently sat at my feet and her animal continued down along the trail. We all exchanged polite “hellos” and “thank yous,” and went on with our days — but that’s not always the case. Dogs are welcome to join their humans on about every trail in Eagle County. There are a few exceptions, and routes such as the paved recreation path and wilderness areas often require dogs to be on a leash, but in general Fido can roam free — with caveats. Rule number one: Always hike with a leash. Even if your dog is a master of voice commands, it’s still courteous to other users. If they see a leash, then they know you have a way to restrain your dog. You might trust and know your pup, but that’s not the case with most other hikers, bikers and horse riders you’ll encounter. Rule number two: Pick up poop, or at least push it off the trail. Along with unleashed, untamed dogs, Waugh said most conflicts between dog walkers and everyone else involves poop. The best solution is to bring at least one or two bags with you, and then carry them with you to a trash can or, if you’re deep in the wilderness on an out-and-back trail, then leave it in a place you’ll remember to pick up on your way back through. What if you don’t have a bag? You won’t get a ticket, Waugh said, but only if you show a little courtesy to other users and sweep it off the trail. Serious conflicts are rare, but Waugh said those two items — picking up poop and controlling your dog — can solve the vast majority of problems. As Summit’s population continues to spike, he hopes dog walkers and everyone else can live in peace. The alternative isn’t pretty.